F1-Demons - David Coulthard Wins Australian GP. David Coulthard and the Mc Laren team has something to cheer about...finally. After days of fuming at the FIA regarding the new regulations the team set up a sort of victory by winning the Australian F1 Grand Prix at Melbourne on Sunday. Montoya took the second spot and Michael schumacher had to be content with a fourth place. While the results have been ascribed to the new FIA regulations, the weather also had a part to play in the weekend race. While Montoya lost control of his car on the 48th lap Coulthard did a fine job of starting 11th on the grid to take the podium. Ferrari's Michael Schumacher was given a black flag while team-mate Rubens Barrichelo slid on the grass to become the first racer to retire. Fellow Mc Laren driver Kimi Raikkonen of Finland finished third. While Montoya finished second here for the second time in a row. This is Coulthard's second win here after 1997 and his 13th career F1 checkered flag. 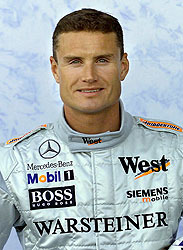 Beating Montoys by more than eight seconds, Coulthard avaraged 120.623 miles at the Melbourne circuit.